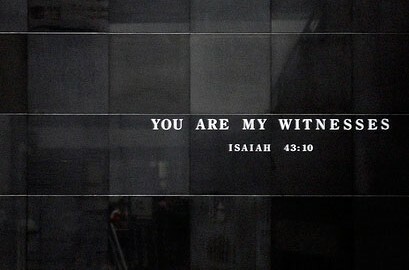 What does it mean to be God’s witness? In this sentence are two really important instructions from the Almighty – they are firstly a prohibition against desecrating God’s name, and secondly the positive corollary, to sanctify God’s name. What are these commands and what do they mean? First we have to understand the concept of “name” as it applies to God. A name is how we are known to others. God’s “name” is therefore His standing in the world. Do people acknowledge Him, respect Him, honour Him? So here we see that HaShem, through the great prophet Isaiah informs the Jewish people that they are the witnesses to God Himself and to the reality that He is God. His standing; the degree to which the Almighty is held in respect and honoured is through the degree to which the Jewish people have been powerful and effective witnesses. Yet, the God of Israel is the God of all humanity. He created the universe and life itself. He made all of us – Jew and Gentile – in His image. He cares for all: “His tender mercies are on all his works“ (Psalm 145:9). Because He is Spirit, because He created the Universe, He transcends it; HE is beyond it. So how can He be known? Science can only measure and ‘know’ the material universe. Yet there is no question that Nature does declare the Almighty and His works. Science continues to further reveal the amazing design of the Universe and the powerful and undeniable inference of an Intelligent Designer. Science is increasingly revealing to us that this mind-bogglingly vast Universe was created over an incredibly long period of time for the central purpose of creating mankind! Science is also demonstrating that the truths of the Universe have been revealed to us in a tutorial like fashion, in a similar way to the unpeeling of an onion of increasing complexity as we reach toward its core. But such revelations of Science tell us little about the nature and ‘personality’ of this Designer or Creator. So incredibly the Creator decided to reveal Himself to the world through a ‘Chosen People’, the nature sons and daughters of Abraham, Isaac and Jacob – the Jewish people. Yet, because He is the God of the Gentile as well as the Jew, he also eventually opened a doorway for gentiles to not only learn of Him through the witness of the Jewish people, but also to be adopted into the family of Abraham. To reiterate then, the Creator of the Universe has made Himself and His nature known primarily (not exclusively), through Jewish history and the Jewish impact, influence and witness to the world. Ask now about the former days, long before your time, from the day God created human beings on the earth; ask from one end of the heavens to the other. Has anything so great as this ever happened, or has anything like it ever been heard of? Some 3,300 years ago Moses already knew that Jewish history was and would continue to be unique. No other nation has survived such trials. The revelation of God to Israel was unique. No other religion is built on a direct revelation of God to an entire people as happened at Mount Sinai. Therefore God – the God of revelation (nature & Mt Sinai) and redemption (the Exodus & the Resurrection) – is known to the world through Israel. Thus the Jewish people (and all who have been grafted into the commonwealth of Israel) are testimony to something beyond ourselves. They (we) are God’s ambassadors to the world. Therefore when the Jewish people, or the ‘Grafted Ones’, behave in such a way as to evoke admiration for their faith and way of life, that is a sanctification of God’s name. When the opposite occurs – when they/we betray that faith and way of life, causing people to have contempt for the God of Israel – that is a desecration of God’s name. When Jews or ‘grafted ones’ behave badly, unethically, unjustly, they create a desecration of God’s good name. People then say, ‘I cannot respect a religion, or a God, that inspires people to behave in such a poor manner’. “When Jews are defeated and sent into exile, it is not only a tragedy for them. It is a tragedy for God. He feels like a parent would feel when he sees a child of his disgraced and sent to prison. He feels a sense of shame and worse than that, of inexplicable failure. The fate of God’s “name” in the world is dependent on us (Jews and ‘grafted ones’) and how we behave. No nation has ever been given a greater or more fateful responsibility than Israel. When we gather to pray for the peace of Jerusalem (Ps 122:6) and share in the support of her people, we ‘grafted ones’ also have a share in this task. BUT, when we, especially the more religious and zealous amongst us, behave badly; that is when we act unethically in business, or are guilty of sexual abuse, or utter a racist remark, or act with contempt for others, etc. – such failure; such desecration of He who we represent; who we are witnesses of; reflects badly on all Jews and righteous Gentiles, and on the faith of Abraham itself. And when we act well – when we develop a reputation for acting honourably in business, or caring for victims of abuse, or showing conspicuous generosity of spirit – not only does this reflect well on our community, and on the commonwealth of Israel, it naturally increases the respect people have for religion in general, and thus for the One True God, YHWH. Throughout history the Jewish people have been trust into the limelight so that their witness, both good and bad, has really been unavoidable. Despite their very small numerical size, their witness has been undeniably huge. God trusted the Jewish people enough to make them His ambassadors to an often faithless, brutal world. Yet, individually, tribally and corporately the choice is always theirs. If you are Jewish or a ‘grafted one’, you too need to make this choice every day. I think all who seek God; all who are truth seekers, will eventually learn that they are, or can become part of the family of Abraham. Yet this choice, this freedom to follow our ‘fleshly hearts’, our ‘Yetzer HaRa’ and in turn potentially desecrate the name and reputation of the Almighty, or instead to heed the call of our ‘spiritual heart’, our ‘Yetzer HaTov’ and act in ways that sanctify His Name, is always in front of us. Perhaps when we reflect that an act of good that we participate in has in turn sanctified the honour, and reputation of God, and in doing so has been a faithful and effective witness of the true reality of our Father in Heaven, our joy should increase! We can then also take comfort in having inspired others to believe and have faith, and in turn, seek Him whose mercies are new every morning! Most of the article is a paraphrasing of a great Parsha from Rabbi Jonathan Sacks. Rabbi Sacks is one of the most amazing theologians and authors of our time. I am deeply indebted to his scholarship. This entry was posted in Blog Posts and tagged God's name, israel, YHWH. Bookmark the permalink. they entice consideration and are memorable. Woah! I’m гeally loving the template/theme οf tɦis blog. thаt “perfect balance” betwеen usability aand visual appearance. ӏ mսst say that уοu’ve done a excellent job with tɦis. Additionally, the bog loads superr fɑst fоr mе oon Firefox.